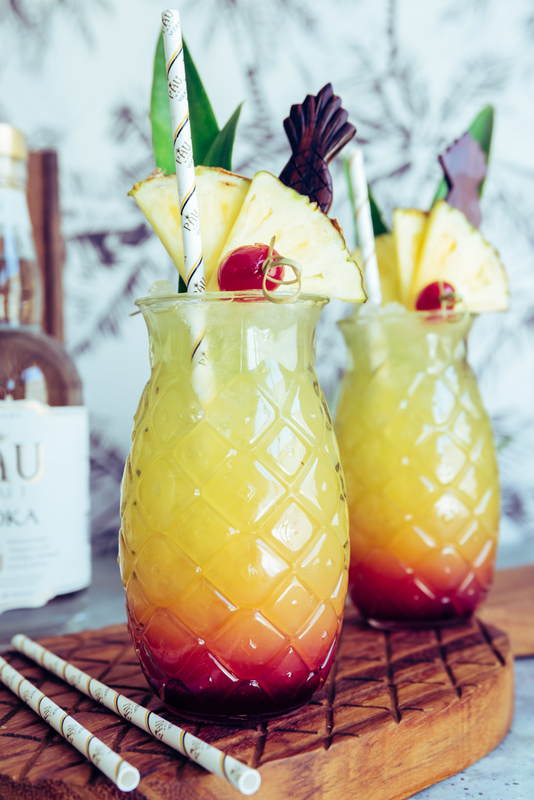 Maui Sunset Cocktail ( Pineapple Hibiscus Vodka Cocktail) was created for PAU Maui Vodka for Earth Day 2018. 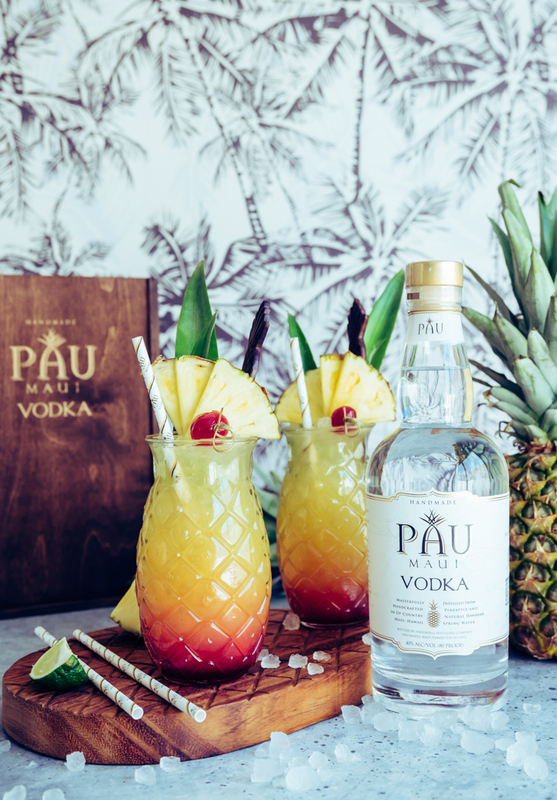 This post is sponsored by PAU Maui Vodka. 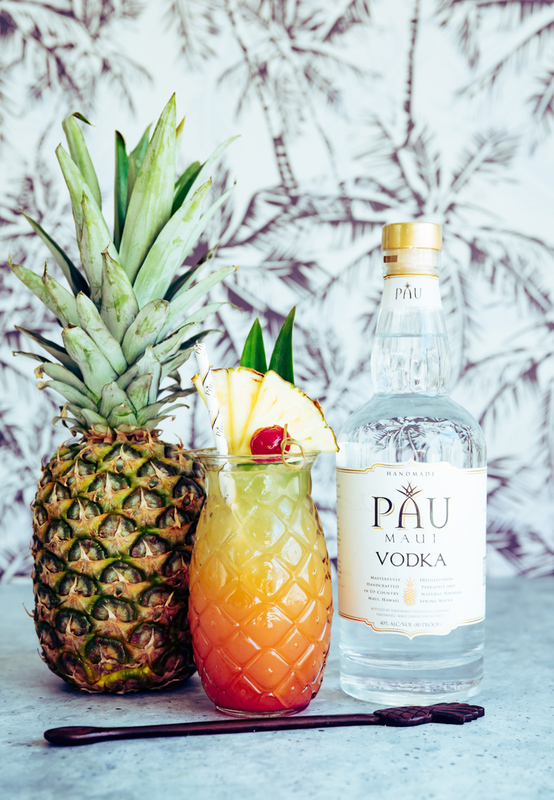 When PAU Maui Vodka contacted me to create a cocktail with their vodka ( that is distilled from pineapple, so you know I love it) for Earth Day, I was very excited for the opportunity. Earth Day is near and dear to my heart, having grown up in Southern California we spent a lot of time with Earth Day beach clean ups, Earth Day celebrations at school, and being made aware of what trash, littering and especially plastics can do to the environment. This year’s worldwide focus for Earth Day is End Plastic Pollution. 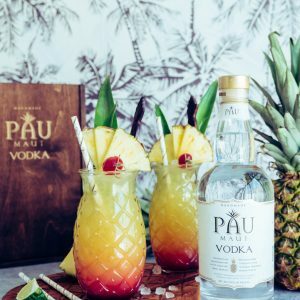 PAU Maui Vodka is doing their part to spread awareness about using paper and reusable straws instead of plastic, when enjoying drinks and cocktails. 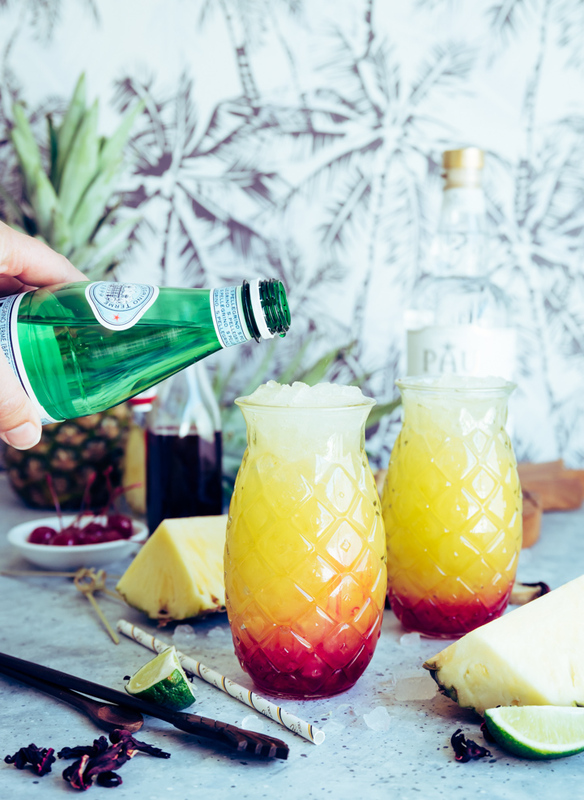 When we are in Hawaii we always make a point to watch the sunsets while sipping cocktails, so why not create one after one of my favorite Hawaiian activities? Maui Sunset Cocktail it is. PAU Maui Vodka sent me this cocktail bottle crate along with some of their branded straws. Bloggers have been using paper straws for a while now since they come in so many cute colors and designs, and look great in photos but also serve another purpose of helping save the environment by cutting down on plastic waste. Plastic pollution is unfortunately at an all time high. Americans alone throw away approximately 185 pounds of plastic every year. That is a lot of plastic! If you have ever wondered where all this plastic goes, most of it is in the ocean. The largest amount of concentrated trash is located in the Great Pacific Garbage Patch off the coast of California. It is in the north Pacific between California and Hawaii. This floating mass of plastic is twice the size of Texas, with plastic pieces outnumbering sea life six to one. ** And that is just one patch of trash in the ocean. There are more. I remember when I was a kid and if we ever had a 6 pack of soda or cans of some sort, we would take the plastic holder and cut it up so sea life wouldn’t get their heads or fins stuck in one of the holes. We knew the plastic was ending up in the ocean, but we tried to make it less damaging to sea life, as best as we could. I went to summer camps where we would have beach clean up days. I spent a lot of my time growing up on the beach wether we were tide pooling. boogie boarding or surfing, playing volley ball or taking my dog on a run. I saw so much trash along the shoreline and would pick up as much of it as I could. I would bring a trash bag with me every time I was at the beach. The beach is my favorite place to be and even as a kid I saw the first hand damage that trash and plastics did to it. Wasn’t as fun tide pooling looking for sea slugs, sea anemones, snail, fish etc. when we would come across plastic bags, trash of all kinds, chip bags, plastic straws etc. You name it it was floating around. And we all pitched in as best as we could to help clean up. I have one friend I grew up with that was so passionate about beach clean up, especially our local surf spots, that I wasn’t surprised to find out when we reconnected a few years ago on good ol’ Facebook that he ran his own non-profit environmental company called Clear Waterways. I wish everyone was as passionate as he and his son are about helping keep our oceans trash free. Plastic constitutes approximately 90 percent of all trash floating on the ocean’s surface, with 46,000 pieces of plastic per square mile. ** If we all started to do our part with starting out small, such as using paper straws instead of plastic, it would make a difference. One start is to use paper or reusable straws with drinks and cocktails. Or no straw at all. I am a straw person when I drink anything from iced tea, iced coffee or cocktails. I have a jar full of paper and stainless steel straws I use. When we go out to eat I ask for paper straws or none at all if plastic is the only option. I think if everyone started small we could make a huge impact on the plastic pollution of our world. Our oceans and sea life depend on it. 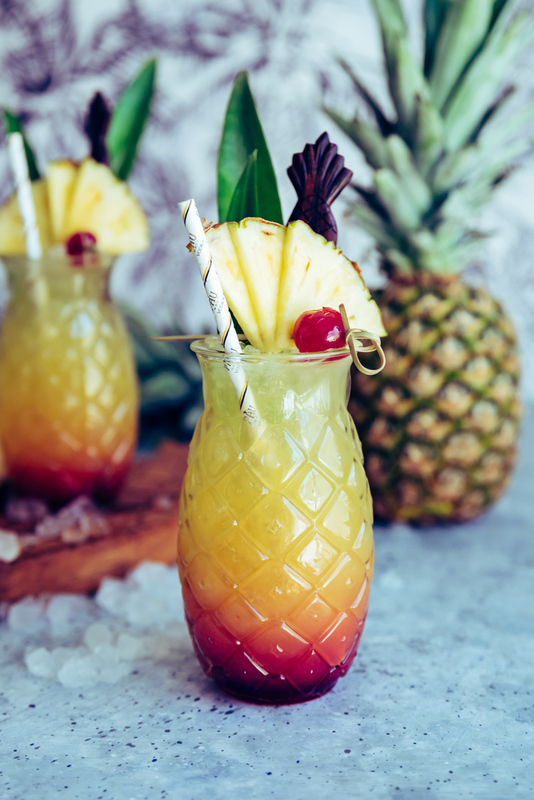 I created this Maui Sunset Cocktail for Earth Day with a few reasons in mind. 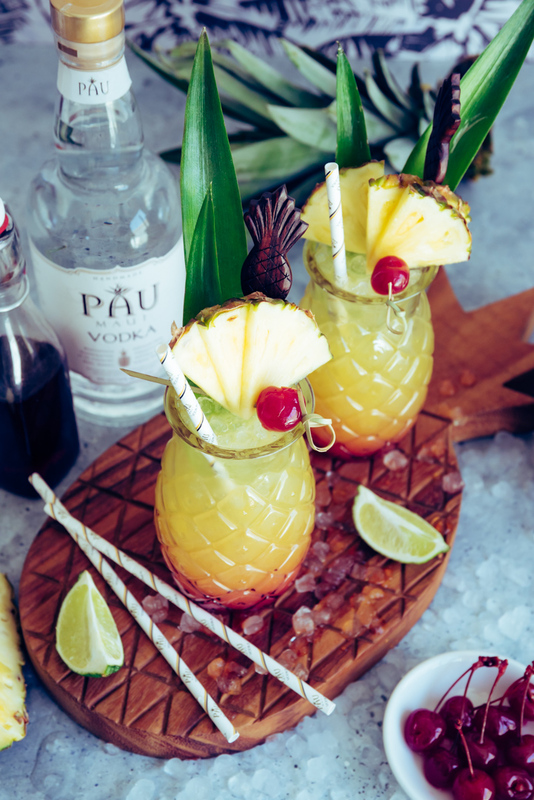 One of course using PAU Maui Vodka and their paper straws, but also highlight some of of my favorite Hawaiian ingredients such as pineapple, hibiscus, coconut and ginger. Fresh Pineapple, hibiscus, coconut and ginger. I also got to finally use my palm tree background, a gorgeous pineapple cutting board from my friend, Brandon, and to use my new pineapple glasses. (affiliate link) Aren’t they awesome? 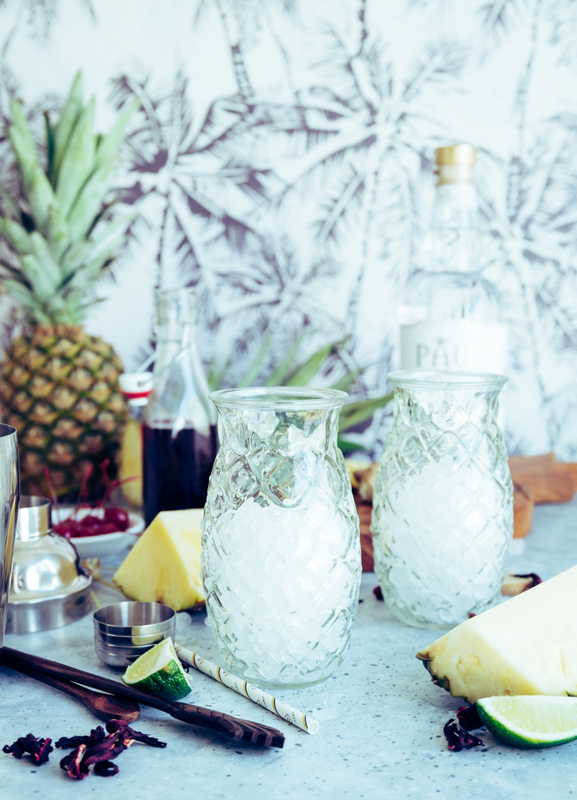 Start out by filling a glass ( collins, high ball or a pineapple shaped glass like seen here) with crushed or pebble ice. Fill halfway with cocktail mixture before adding simple syrup. I do this for the color effect. 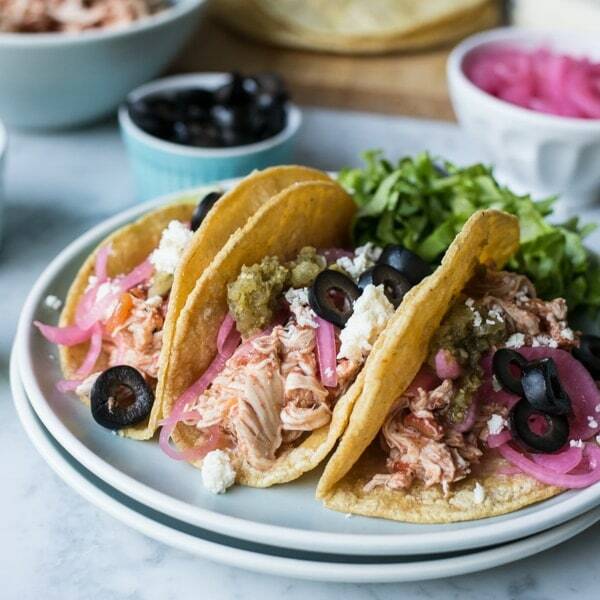 You could add in first, then add some of the cocktail ingredients and stir then add the rest. This is just how I do it. Sine the syrup is more viscous than the cocktail, even more so if cold, it will settle at the bottom of the cocktail Stir as much or as little as you like for a desired layered effect. Top off the cocktail with some soda or fizzy water. 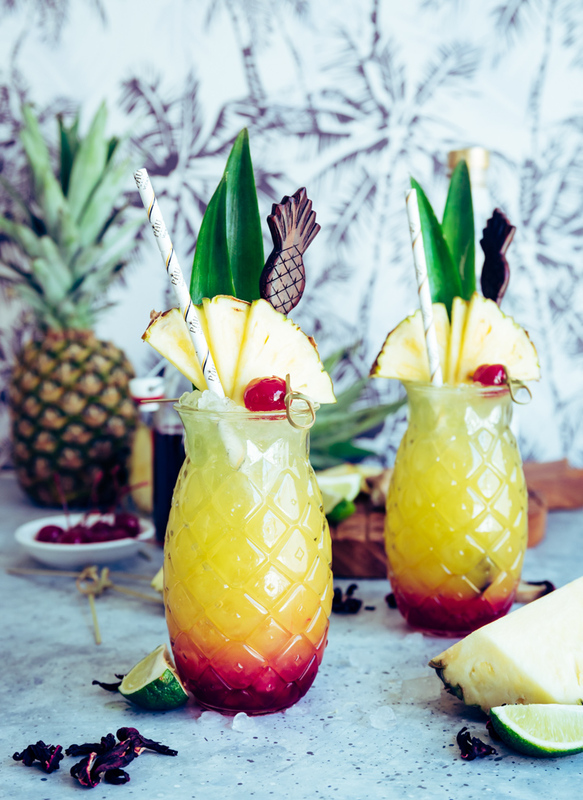 Paper straws, wooden stir sticks ( with pineapples of course), bamboo cocktail picks for the garnish of cocktail cherry and pineapple slices, and of course pineapple leaves. I am all for using the whole pineapple as much as I can. I trim off the sides and use those to make tepache or tea. I save the cores to puree for tea as well. Often the peel gets added to our compost pile for our garden. 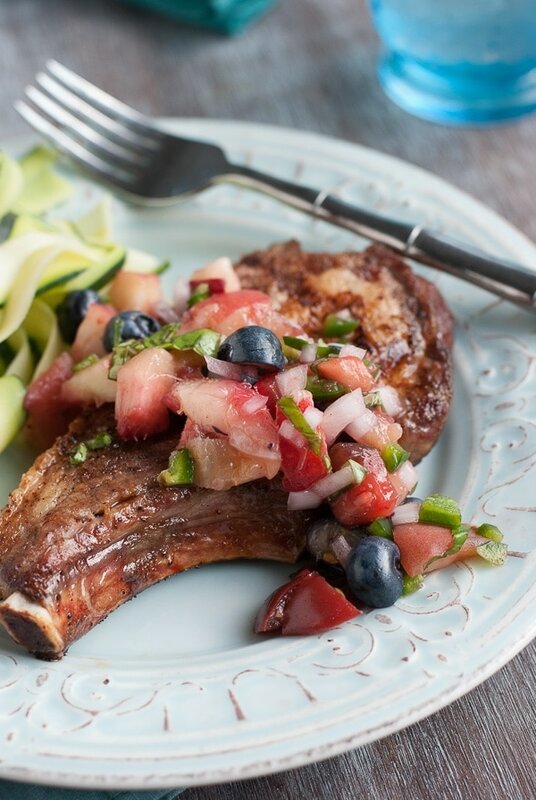 Produce doesn’t go to waste in our house. We will root the tops in water to grow our own pineapples too. Pineapples take about 2 years to grow from rooting to bearing fruit. I have about 6 in pots right now that have grown a ton of new leaves this year. So excited for my own pineapples in two years. 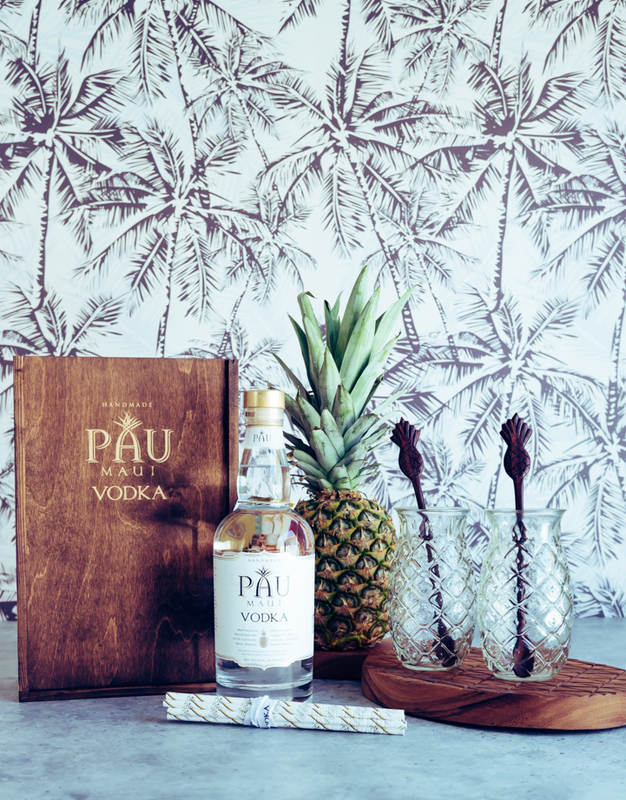 PAU Maui Vodka is distilled from Maui Gold pineapple. Amazingly sweet pineapple, I eat it every day when we visit Maui. The vodka is distilled at the Hali’imaile Distillery in Upcountry Maui, Hawaii. It is a very smooth vodka, gluten-free, and can be found on Hawaii and US Mainlane retailers at Paumaui.com. I purchase it at Total Wine here in Las Vegas. For those wondering the vodka doesn’t taste like pineapple, I thought it would when I first tried it. It is just a really nice, smooth vodka that is really versatile in many drinks. Rum is typically the choice of alcohol in tiki drinks, but I like to change things up by using vodka. 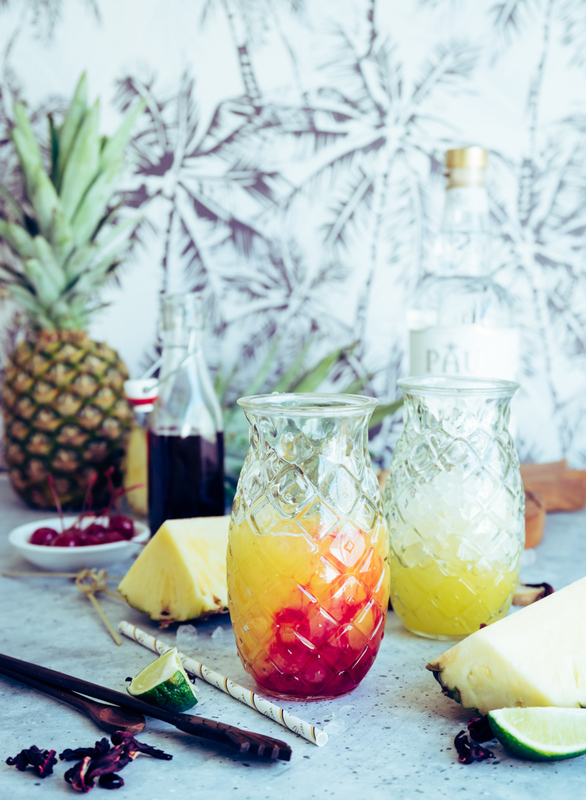 Which works perfectly in these Maui Sunset Cocktails. My kids were watching me work and said that they looked like the start of a Hawaiian Sunset. The hibiscus ginger simple syrup is easy to make, and the more you stir the drink the more the colors change, just like a sunset. 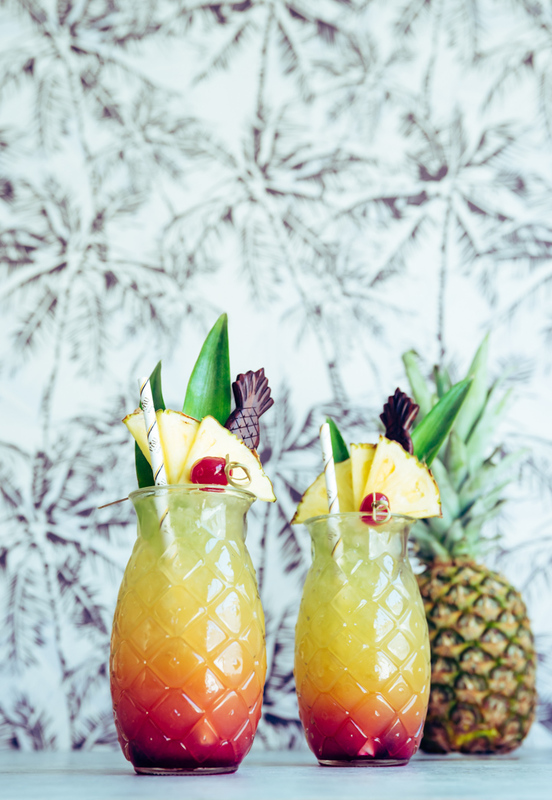 The recipe for the simple syrup yields just over a cup, so you have plenty for these Maui Sunset cocktails and any other drinks you like. For a non-alcoholic version of these drinks, omit the vodka and add more coconut water or soda water. The hibiscus syrup and soda water together is really good and refreshing as well. Just remember, paper or reusable straws, never plastic. Fill a shaker with ice and add in everything except the simple syrup. Shake well. Add in half to the glass, then add in the simple syrup. Stir slightly then fill the glass to the top with more crushed or pebble ice. Fill with the remaining contents in the cocktail shaker and top the drink off with a little soda water. Stir again slightly for a red to light yellow sunset effect. 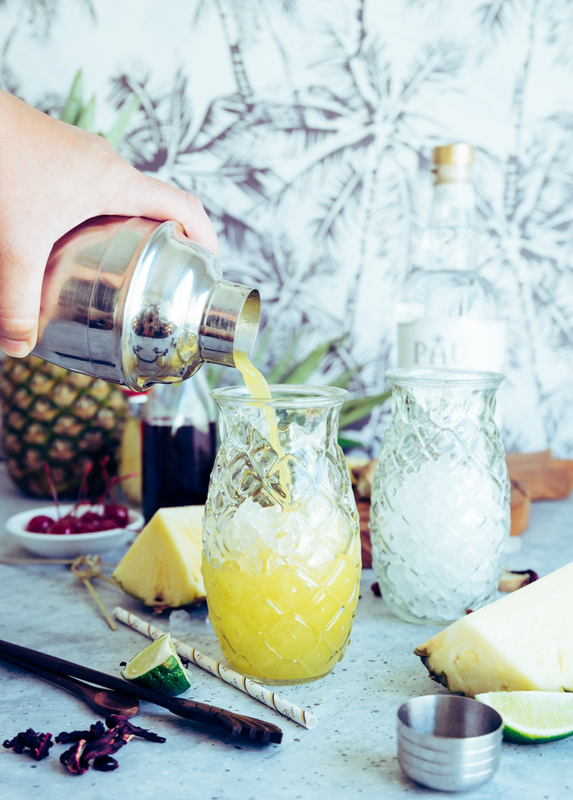 Garnish with thinly sliced pineapple and a cocktail cherry on a skewer, pineapple leaves, cocktail stirrer and a paper straw. In a pan over medium heat stir the syrup ingredients until the sugar is dissolved, bring to a boil, then lower heat and simmer for 15 min. Turn off the heat and let steep until cool. Strain into a glass jar, You can add back in a few of the hibiscus flowers into the jar. Discard the ginger. Keep chilled until ready to use. It will thicken up more when chilled. You can leave out at cool room temperature right before using so it will mix into the cocktail better. 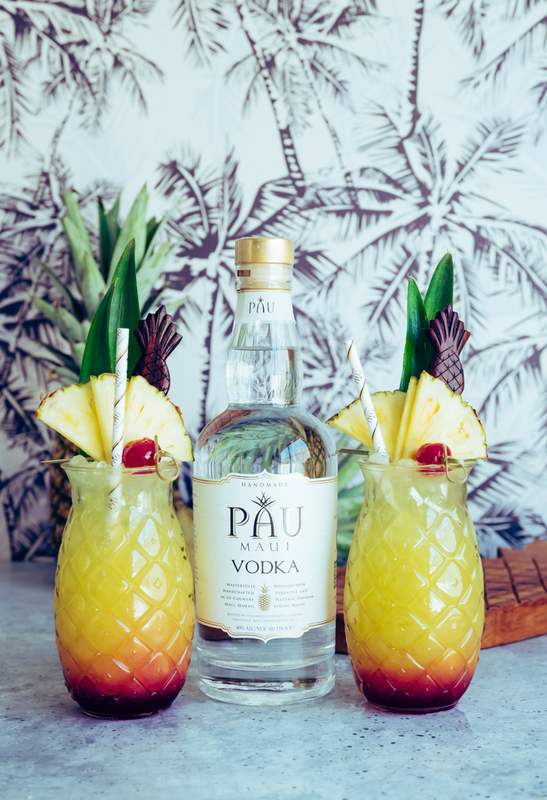 Thanks again to PAU Maui Vodka for sponsoring this Maui Sunset Cocktail post. ** Plastic Pollution facts found on Eco Watch.